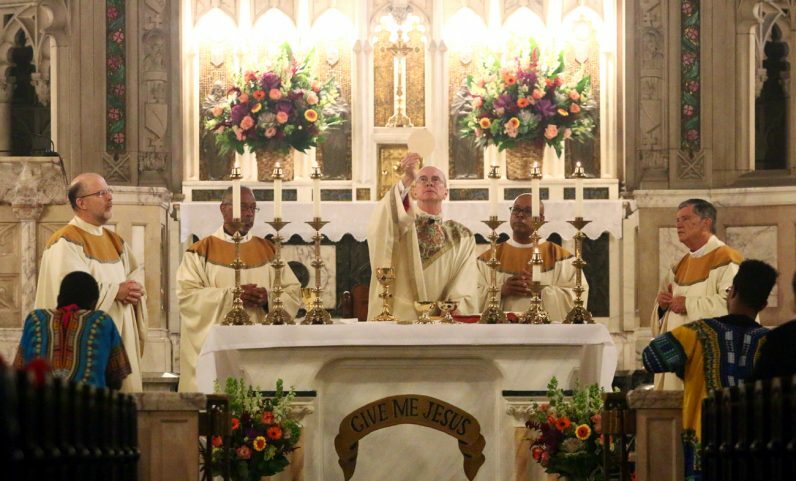 St. Martin de Porres Parish in North Philadelphia marked its 25th anniversary on Sunday, Oct. 28 with a jubilee Mass and dinner celebration. 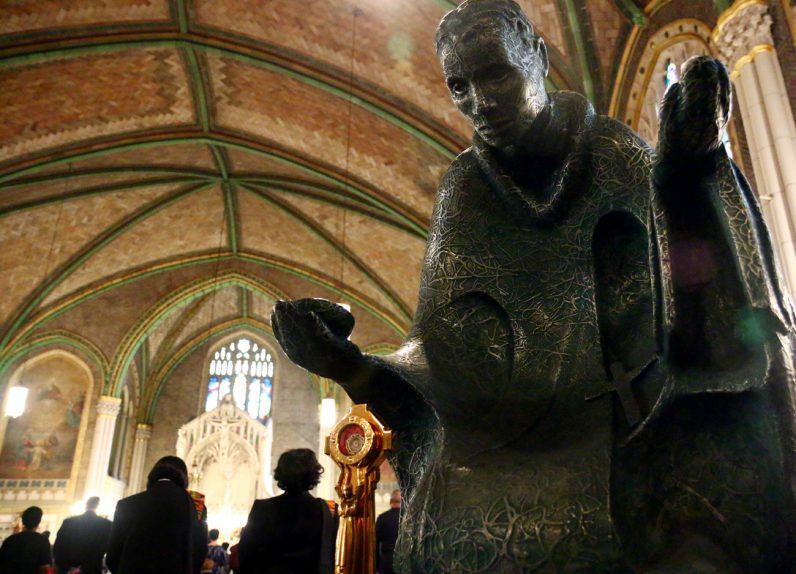 It could just as easily have been called a 146th anniversary, because St. Martin’s traces back to the founding of St. Elizabeth Parish in 1872, as well as St. Columba in 1895 and Most Precious Blood in 1917. All three were combined in 1993 to form St. Martin, using the former St. Columba Church at 24th Street and Lehigh Avenue. St. Martin also holds the spiritual records for two other North Philadelphia parishes that had closed years earlier, St. Mary of the Eternal (1911-1976) and Corpus Christi (1912-1987). All of this is a result of population shifts as the European-American founding families moved out to the suburbs or forgot to reproduce. While the St. Martin de Porres Parish of today is still a territorial parish it is de facto African American, and proudly so. St. Martin is a small parish with roughly 230 attending Sunday Mass, according to recent October Counts, but nevertheless, it is vibrant and self-sufficient. “We are solvent and we pay our bills,” Father Thorne said. “We are not subsidized by the archdiocese. I see no decline in attendance or in collections. We have one of our sons who is in First Theology at St. Charles Seminary and another who is in the Permanent Deacon program. 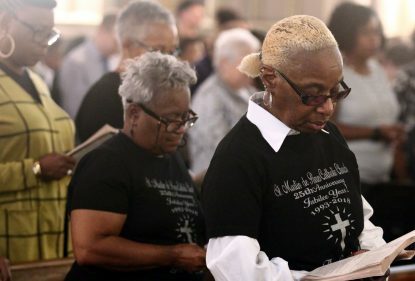 St. Martin de Porres parishioner Rita Felder has worshiped at the church at 24th and Lehigh Avenue in North Philadelphia for 47 years, even when it was previously known as St. Columba Church. Of the parish’s many ministries one of the most noteworthy, Father Thorne believes, is the men’s choir, perhaps unique in the archdiocese. Doug Stanford, who is a member of the men’s choir as well as the adult choir and the parish pastoral council, is a police lieutenant in his day job. He doesn’t live within the parish boundaries, but “I come because I love the church and what we are doing there,” he said. “Part of our calling is to be involved. We have an outstanding pastor. He is a man of God who does everything with integrity and accountability. Many of the parishioners are old, but there’s wisdom here,” he said. Sister Lynn Marie Ralph, a Sister of the Blessed Sacrament, has been at St. Martin for the past seven years and is the director of religious education. “It has a big family atmosphere,” she said. “The people all look out for one another and people feel very welcome. We are the Kingdom in North Philadelphia. We have active lay leadership.